Student drivers and trucking schools have long needed an automated mechanism to easily send applications and communicate with motor carriers. Drivers spend an excessive amount of time and effort manually completing multiple applications, while the average trucking school is often inundated with managing paper and serving as a liaison. Harried as well are the carriers, burdened with the time-intensive task of tracking requests, responding to schools, responding to drivers, hiring, and finally onboarding newly qualified drivers. Fortunately, Tenstreet has removed these pains for the driver, trucking school, and carrier. Leveraging the Tenstreet School Network, student drivers simply complete one application for the school. As the number of applications increase (due to ease and speed of completion – thanks to the IntelliApp’s auto-population feature), so do a school’s placement rates. Featuring a Transferred Drivers Report, a real-time school and carrier applicant communication channel, and the ability for carriers to automatically send pre-hire and denial letters in a matter of seconds, Tenstreet’s School Network program dramatically simplifies the process for everyone. We’ve compiled some commonly-asked questions to offer a quick Q&A on our program to get you up to speed. If you have any additional questions, please add them in the comments sections below! Q. Is there a cost associated with this? A. No, there are no fees for an existing carrier. For a trucking school to join the network, there would be a small monthly fee for an abbreviated version of our IA and Xpress services. Q. Does the Trucking School transfer DOT-compliant applications? A. The school-specific IntelliApp is treated by most carriers as a “lead” application, as it does not include signatures or signed releases. It does, however, include license, employment, accidents, and violations/convictions information. Once the carrier is interested in moving forward with the student, the carrier would then send the driver a link to their company-specific IntelliApp. We offer a free Drip marketing campaign to target these applicants, further automating the process. Q. Is there a limit to the number of schools I can be linked to? Is there a limit to the number of carriers I can be linked to? A. No, there is no limit! Both parties simply would need to agree to network. Q. If I am working with a trucking school that is not a Tenstreet client, how do we connect them with Tenstreet? A. Simply give us the name of the school you wish to work with, and we will reach out to them. Alternatively, you can ask the school to reach out to our contact, Mike Hanisch, at 918-398-0811. Q. How can I see a list of every Trucking School participating in the network? A. While the list continues to grow, our program includes schools such as Career Path Roadmaster, Georgia Driving Academy, The CDL School, and American Truck Training. If you have a school you’re working with, please encourage them to reach out to us, or again, let us know their name and we will reach out to them. Your Account Manager also keeps an updated list of school network participants. Q. If the pre-hire letter is set up as an electronic form and sent in an automated process, is there a fee? A. No, the set-up of your pre-hire and denial letters are included for free in our program. However, a fee could be incurred if you would like to add a lot of customization or automation (e.g. pulling in application data, tags, adding additional workflow processing, etc.). Q. Can the schools provide a Certificate of Completion of Entry Level Training? A. One of the greatest things about this program is that – like most things Tenstreet – it can easily be adapted to meet the growing needs of both parties. Should a school or carrier express a need to transfer additional documents from dashboard to dashboard, we would easily be able to accommodate this request. Q. After the school transfers the application to the carrier, do we still need to get a carrier-signed release? A. Yes. As the school isn’t the entity that will do this hiring, it doesn’t have permissible purpose to ask for a release. The carrier, as the potential employer, would be the only one with the authority to request a release from the driver. We offer a free Drip campaign to facilitate completion of your carrier application, which would include any releases a carrier wishes to request. What other questions do you have that we need to answer? Let us know in the comments section below, and we’ll edit this blog to include them. Are you a carrier who wants to collaborate with schools, or are you a school who wants to have a streamlined process with carriers? Contact Mike Hanisch, at 918-398-0811, or your account manager. Watch our 15-minute webinar to learn more, and then jump on board! We look forward to having you. My name is Eddie Torres owner at Austin CDL Services. I have been receiving e-mails from your company for client/student verification. Can you add us to your lists of schools? Good morning, Eddie – thank you for your interest! I’ve forwarded your note to our school network team; they’ll be reaching out to you soon to get you set up! 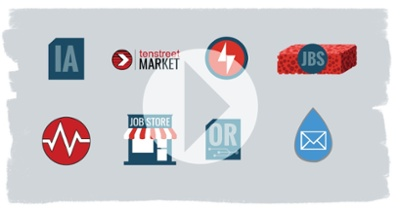 Watch Our Marketing Solutions Webinar to learn more about Job Store + Active Jobs!